The Information Panel displays all the information (metadata) embedded in your clips. It consists mostly of editable and some read-only fields (not editable). You can edit the fields marked with a small «pencil» icon, as well as flags, ratings, labels and cue points. By editing and adding your own information to the clips you can simplify managing tasks like searching clips, varying the shown clip order or filter the library for clips with a certain attribute, which you can do by using smart folders. The information panel is subdivided into six tabs: General Info, User, File, Header, Look Library and Transcoding. 1 General tab: It encloses the clip information extracted from the metadata like the timecode, exposure, production info, camera and format information. Additionally, there are some tips for a faster metadata editing available in the article Tips & Tricks: Quick metadata editing. You can also apply Image transformations like anamorphic de-squeezing and image flipping. You can edit the fields marked with a small «pencil» icon. 2 User tab: It is fully editable. There you can set the camera letter, edit scene shot and take metadata, flag, rate and label the selected clip. Besides, you can add a comment and cue points to it. 3 File tab: The “File” tab provides you an overview of all file resources of the selected clip. 4 Header tab: The “Header” tab contains read-only detailed technical information metadata —in a raw format— of the selected clip. 5 Look Library tab: Silverstack enables you to manage looks within Silverstack in a look library in order to keep a proper overview of all the looks in your project. The look library allows you to store new looks, edit their metadata, apply looks to one or multiple clips, as well as to import looks from LiveGrade. For more information, please check the article The Silverstack Look Library. 6 Transcoding tab: Silverstack allows to manage transcoding configurations and their transcoding settings in the Transcoding tab. 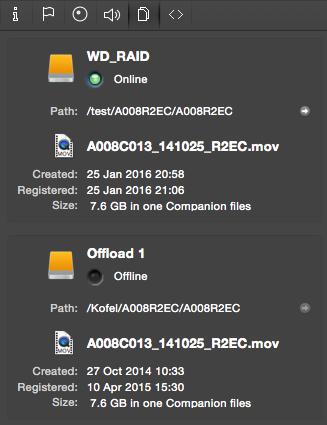 A transcoding preview of the current image is automatically shown in the player view when the transcoding tab is opened. For more information about the transcoding tab and transcoding in Silverstack please read the article Transcoding in Silverstack.